About halfway between Dawnstar and Winterhold, on a high cliff. 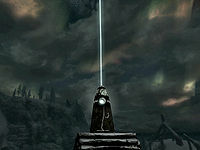 The Tower Stone is one of the thirteen Standing Stones scattered across Skyrim. 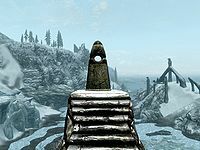 The Tower Stone can be found about halfway between Dawnstar and Winterhold, on a high snow-covered cliff, north-northeast of Hob's Fall Cave. Its description reads: "Once a day, those under the sign of The Tower have the option to automatically open an Expert or lower lock." It is found high on a glacier or cliff, the only approaches are from the east or southeast. The stone is standing at the top of a flight of stairs facing due west. There is a bird's nest in a bush overhanging the edge to the right of the stairs with a pine thrush egg inside. To the left of the stairs is a snowberry bush among some rubble. Two quicksilver ore veins are located 220 ft east of the stone. If you approach the stone from underneath by the shoreline, you will not be able to discover it. This may also make it seem as if the marker is placed in the wrong place.